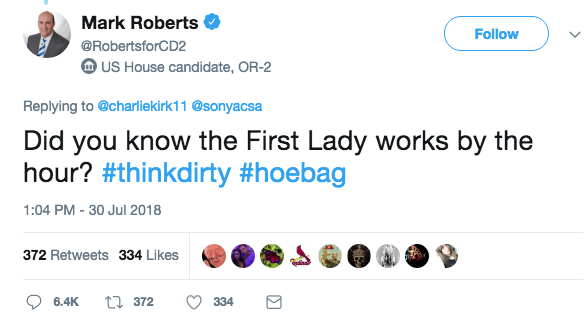 In a bizarre series of tweets, McCarthy, a California Republican, and Mark Roberts, an Oregon independent, bickered about a prostitution reference to the first lady. On Monday, Roberts responded to Turning Point USA founder Charlie Kirk's tweet about Melania Trump having "thirty-nine fewer staffers" dedicated to her than were employed under Michelle Obama. The Oregon candidate for Republican incumbent Greg Walden's seat immediately received backlash on the social network for the comment. "There are thirty-nine fewer staffers dedicated to The First Lady of the United States (FLOTUS) than under Obama There are only five staffers dedicated to Melania Trump vs. forty-four staffers who served Michelle Obama," Kirk tweeted Monday. Roberts responded: "Did you know the First Lady works by the hour? #thinkdirty #hoebag." Among his Twitter detractors, McCarthy jumped into the thread to call for Roberts's account to be banned. ". @jack this attack on @FLOTUS is disgraceful. Comments like these have no business on any platform. This account should be banned ASAP," McCarthy tweeted. A wide-ranging debate on "shadow banning" and allegations of right-wing censorship have been touched on by President Donald Trump, Senator Ted Cruz and even Infowars conspiracy theorist host Alex Jones. Several social media outlets, including Facebook and YouTube, have issued temporary bans against content they view as "hate speech." I invite that hosebag to sue me. Roberts has a history of odd tweeting habits, with several of Tuesday's tweets taking on random critics with such questions as "Seriously did you get out of high school alive?" Roberts took to his Twitter account to detail whether or not he was an independent or a Democrat and even challenged Melania Trump to sue him over his use of the word "hoebag" in the previous tweet. "I invite that hosebag [sic] to sue me," Roberts responded. Among Roberts's previous claims to fame was having sent in an audition tape for a role in the Vietnam War movie Full Metal Jacket and being an "expert Windsurfer." 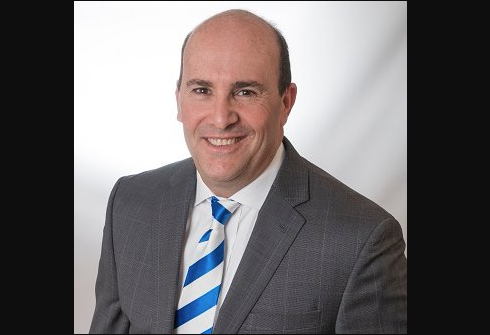 Roberts faces Democrat challenger Jamie McLeod-Skinner for Republican Greg Walden's 2nd Congressional District seat in the November 6 election. In a later tweet, Roberts continued to double down on the FLOTUS insult theme, particularly making a stripper reference toward Melania Trump. "You start whipping out $100's and see how #classy she gets #makeitrain!" he tweeted.